If you have a sweet tooth or you love everything sweet. Or may be you are like me who loves to hog on to desserts first before I move to main food, then Baris awaits your visit to indulge your taste buds into a sweet temptation. A menu that is curated by their chef Mr. Sahib Ibis, the entire range of summer dessert is loaded with summer cool ingredients, that represents the perfect blend of hand picked summer fussion dishes. And the portion sizes are so indulging that you won’t mind those extra calories. Best part of the food at Baris is that it marinated the food much longer to achieve the perfect blend of spices and taste unlike the over cooking that we generally do while making food, that you end up getting the taste of spices only. 1.) Aam Lava ( Rs. 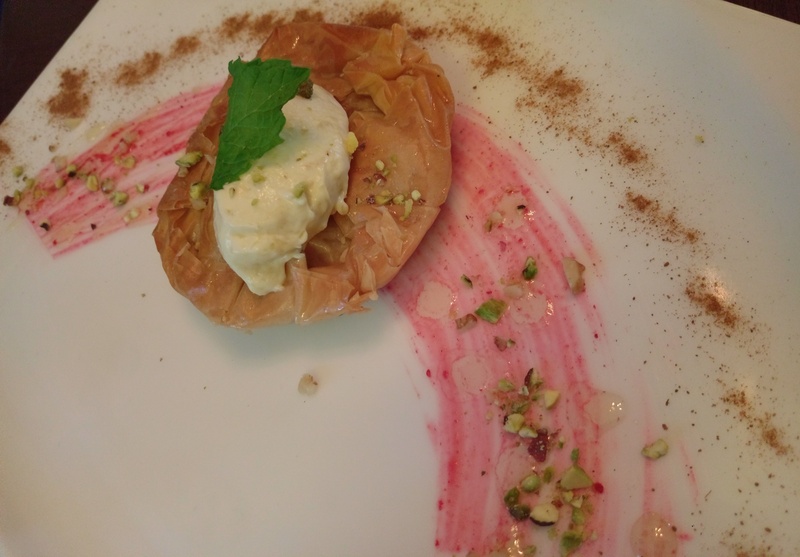 325) : in case you could follow my last blog on Baris or have been to this Mediterranean dining then you need no introduction to the best item on their dessert menu, yes it’s Baklava. And Aam Lava is a mango infused traditional Baklava that is served with mango cinnamon syrup. And a presentation to die for. Don’t believe check this out. And a mango flavored muse over it, garnished with dry fruits. 2.) Figamisu ( Rs. 325) : Well this is a version of Tiramisu with a blend of figs, savoiardi cookies layered with mascarpone cream. And look at the presentation isn’t it difficult to control. This is devilish for sure. 3.) Twisty Turkish Delight ( Rs. 275) : So as the name goes it’s a Turkish dessert made with carrots, Coconut, walnuts and Cinnamon. And this is one dish you will definitely want to order again. 4.) Kazan dibi Muhallebi ( Rs. 275) : Yaa that’s the name probably the most exotic and is the lightest dessert on the menu on sweet quotient and taste too. It’s caramalised milk pudding with mastic & seasonal fruit salad. It had mango so for me it was the perfect pick. Chilled fruit salad on such a creamy and light base tasted simply yum. 5.) Shambali (Rs. 275) : Last one on the list but not any less. Yes wheat semolina orange pound cake with cinnamon salted caramel & Vanilla ice cream on the top. This is pure Bliss. An ultimate dessert to dig into. 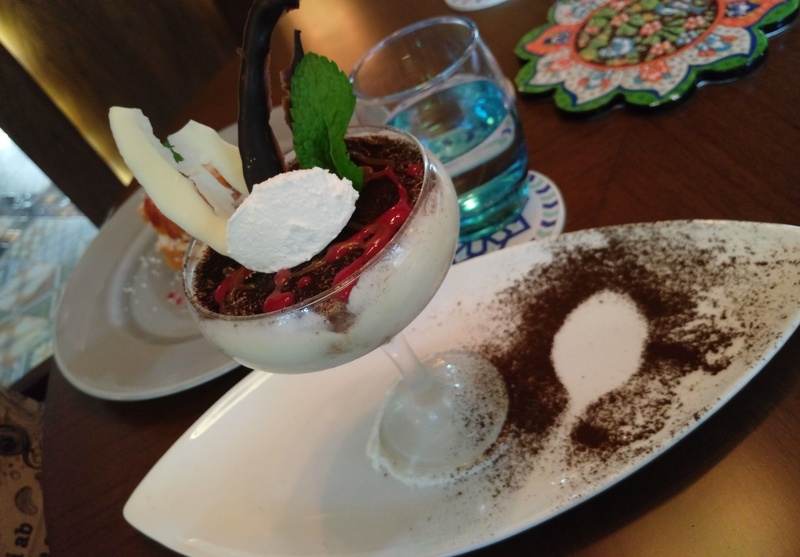 So what are you waiting for, visit this inspired Mediterranean dining place for these incredibly irresistible dessert option for a completely satiating meal. HURRAY! Happy to see you.